This week marked the final DLC release for Call of Duty: Ghosts, the tenth game in the franchise. Before the hype and marketing train really gets up and running for this year’s entry – Call of Duty: Advanced Warfare – let’s take one last look back at the latest entry into the biggest franchise going. Infinity Ward took a little bit of a chance by deciding to start a brand new story, rather than make Modern Warfare 4. There are still similarities – the major set pieces that have come to define the single player campaign experience in the series were still present; perhaps even bigger than ever – it’s not everyday that you fight through a partially destroyed space station orbital weapon. In terms of story content, Ghosts tells the story of a beaten down America, one that had been devastated by a new super power in South America’s Federation. While the game does start with the initial attack, the real meat of the story takes place ten years later. You take control of Logan Walker, son of Ghost team commander Elias, taking part in the fight against the Federation. Early on, you learn of an American fighting alongside the Federation troops, who is revealed to be the former leader of the Ghosts, Gabriel Rorke. The rest of the campaign tells the story of your team’s fight against Rorke, as he tries to activate a second orbital weapon system. In typical Call of Duty fashion, the stakes get higher and higher, and the final climactic confrontation with Rorke goes very similar to the capstones in previous Infinity Ward titles (Zakhaev, Sheppard and Makarov) including the open ending, leaving it abundantly clear that the next IW title will be Ghosts 2. Overall, I enjoyed the campaign, it felt just different enough from the Modern Warfare titles to have its own identity; while at the same time it felt familiar. The biggest drawing point in any Call of Duty game of late has been the online multiplayer. Infinity Ward again made a lot more changes to the formula than I think anyone expected them to, especially compared with their last game, Modern Warfare 3. Drawing inspiration from Treyarch’s work on Black Op II’s 10 point system, the create a class system allows for much more freedom, allowing players to make their classes exactly the way they want. Each perk is assigned a point value, and players are given 8 points to select whatever perks they want – or they can choose to get rid of other equipment like the secondary weapon or lethal/tactical gear to get up to 11 points. This gives players the freedom to either choose firepower in their loadout, or flexibility with a perk heavy one. Most of the perks hit the usual Call of Duty high points, so franchise players will have a good starting point to pick perks from. The other major additions include a contextual lean, giving players the ability to be behind cover, but still able to shoot at enemies; and an increased degree of customization. 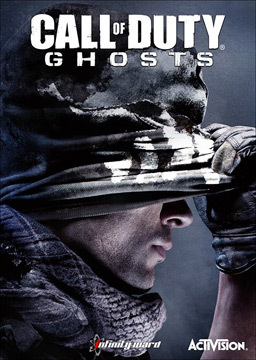 In previous entries, players had title cards and emblems; in Ghosts, they still have those, but can also customize their actual player character as well. 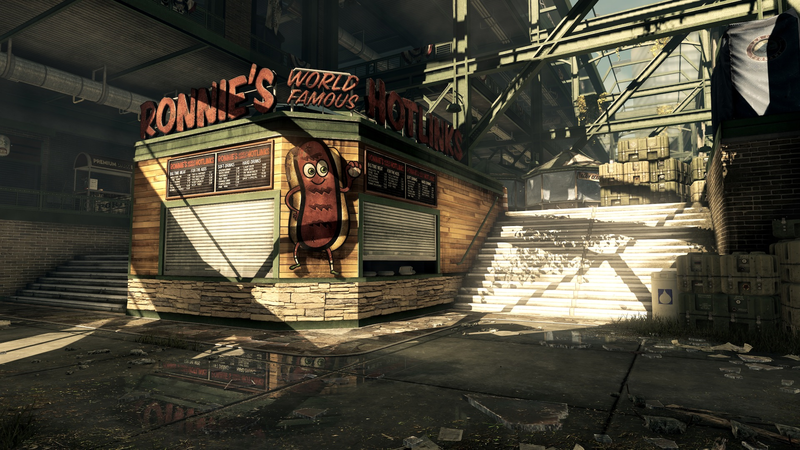 Map-wise, Call of Duty: Ghosts comes with a good mix of maps, with most tending toward the larger size. Assault Rifles feel the most fitting on just about every map. Ghosts also adds in a number of dynamic map features, with some maps featuring a small change that could happen, to others totally changing the map’s layout and flow. The maps themselves feature a good mix of settings as well – ranging from snowy Alaskan harbors, to large medieval style castle grounds, to the outer section of a baseball stadium. There feels like more variation than in previous Infinity Ward titles – previous games have gone more with drawing inspiration from the campaign, with this game using the overall setting as the inspiration. 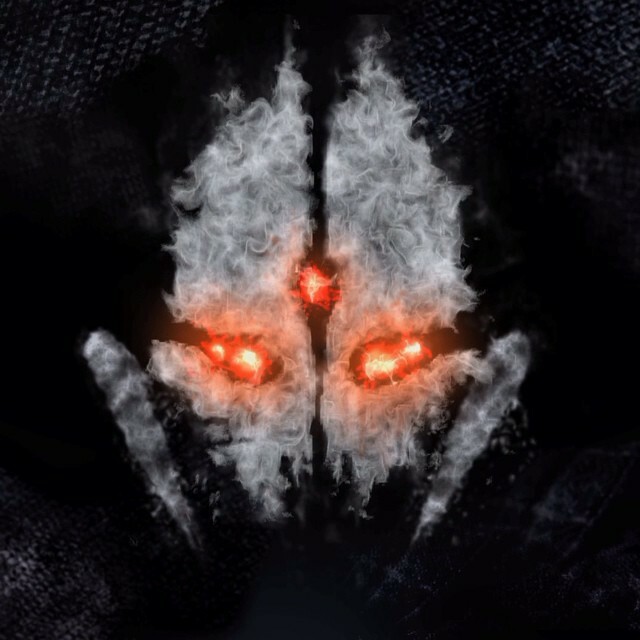 The black sheep of the various modes in Ghosts would have to be Squads. It’s a co-op mode, pitting players against waves of enemies on the different multiplayer maps, much like Modern Warfare 3’s Survival mode. It’s a separate mode, but XP earned is shared with multiplayer as well. That said, the mode’s draw really is limited to playing it through to wave 20 to get the achievement for it, since multiplayer is on the same maps, with a more demanding opponent – actual people. Extinction is Infinity Ward and Neversoft getting co-op right finally. It definitely has some similarities to Treyarch’s zombies mode, but is a totally different beast ultimately. Up to four players make their way through new maps, designed for this mode specifically; fighting against a new enemy – the Cryptids. These aliens were unearthed thanks to a shot from the ODIN weapon system that plays a major role in the campaign. I would classify this as a parallel universe-type story setting, where it ties into the campaign, but clearly split away at some point. Over the course of the original map, players fight their way to a massive crater, at that point triggering a nuclear explosion before racing back to the start to escape. The real meat to the story is told through the DLC maps though, fleshing out the story of the Cryptids and our struggle against them. Extinction is a different character set, with player classes and different loadout options to help survive the hordes of aliens. Surprisingly, Extinction has actually ended up being my favorite mode in Ghosts, thanks to some unbalanced weapons in MP, and a surprisingly deep story and gameplay in Extinction. As we’ve come to expect, Infinity Ward and Activision had a well thought out plan for the DLC for Ghosts. Abandoning the Call of Duy Elite model they used for Modern Warfare 3, and opting for a traditional season pass instead, they went with four separate packs – Onslaught, Devastation, Invasion and Nemesis (ODIN again tying in with the story.) Each pack came with three brand new maps, one remake or re-imagining of a classic, and the next episode in the Extinction story. I think that it was with Devastation that I really felt fed up with the multiplayer – adding in the Predator reward just seemed like they had gotten away from good gameplay, instead opting for headlines; which is a shame because the maps themselves were all actually pretty strong, across all the packs. However, it was because of the DLC that I really got into Extinction, which is where I really think the DLC shines. Each new map felt totally unique, adding in new features with each one that felt appropriate, not obligatory. I’m curious to see exactly how Extinction will factor in to the next Infinity Ward title in the long run, along with seeing how many of these maps they bring back in the future. Ultimately, I think Call of Duty: Ghosts will be placed somewhere in the middle of the franchises entries. It didn’t have the same impact that Modern Warfare or Black Ops did, but was still a strong game. It’s a game that was stuck in between two different console generations, which I think ultimately hurt it – I think it would have been better to pick one generation and stick with it. 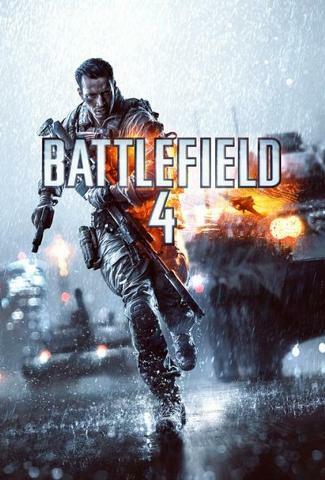 I think the same thing happened with Battlefield 4 as well actually – and it’s something that worries me going into this fall – I worry that developers are spread too thin, creating four different games for four platforms (not including PC). We’ll just have to see how Infinity Ward approaches Ghosts 2 in a couple years, after this years Sledgehammer Games Advanced Warfare and next years Treyarch’s entry. Yesterday I ran quickly through the multiplayer maps that were added to Call of Duty: Ghosts in the Nemesis DLC. Today, I want to look at a few of the new features that they’ve added for the final chapter of the Extinction story: Exodus. Full disclosure, I haven’t actually completed the map yet, since my group wasn’t available to get on last night. But I have been able to run through a good portion of the map, and I think I have a good feel for it. First and foremost, Exodus features every variety of Cryptid enemy, excluding the Breeder and Kraken bosses. They throw them all at you pretty early too, I encountered Hunters during the very first enemy section, and during the first generator defense, I got a good variety of them – Phantoms, Scorpions, Hunters, Bombers and Gargoyles all spawned during the first generator. This ultimately makes a lot of sense tied in with the story, as at this point the Cryptids have all but taken over the planet, resulting in a massive enemy force. A good example of the scope of this particular chapter is in the skybox – they’ve put a good bit of detail into the skybox on Exodus, including a massive swarm of Gargoyles overhead, plus the result of a nuclear explosion in the distance. The other major enemy addition in Exodus is the Ancestor. We got a glimpse of them at the end of Awakening, but this is the first chance to actually encounter them. the first one will appear during the second generator defense, and is announced with a marker on your HUD. The Ancestors don’t have the same amount of health as the Breeder or Kraken, but instead they come with a shield that they will use periodically. In terms of attacks, the Ancestor has a ranged energy attack that has a pretty good degree of homing tied in too; the second Ancestor also had a telekinesis attack that lifted me up and caused a pretty decent amount of damage. There are ways to disrupt it with NX-1 Disruptor grenades or the NX-1 Disruptor itself, but if it’s out of charge, or you don’t have grenades, you’re out of luck. The NX-1 Disruptor stuff is actually pretty neat – the grenades pretty much one shot every enemy I encountered, minus the Ancestors, with a pretty good blast radius too. The actual rifle behaved a little differently, with primary fire shooting smaller bolts of energy that killed scouts and hunters in one hit, while the ADS button fired off a large charged shot; the shot moves very slowly, but has a huge blast radius, and can kill multiple enemies easily, as well as causing a bunch of damage to Ancestors. In terms of level design, they took a slightly different approach to this map. It’s set in a city, much like Point of Contact, but features branching paths, like Mayday had. The difference comes in that the overall path is much less linear than any previous map – the play has three different directions to head in as soon as they load up, and can back track to select a different one at any point. Being the final chapter, I expect the endgame to really ramp up the challenge, and hopefully tie up the story well. 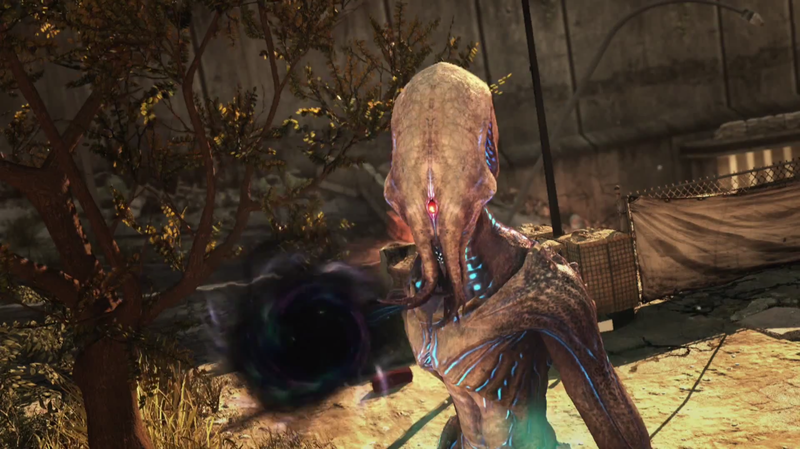 Over the whole DLC season for Call of Duty: Ghosts, I think that Extinction has really been the standout. Each addition has really fleshed out the story, which went from being a pretty standard Alien invasion to something a little bit more; as well as adding in the appropriate new features to each map – new creatures, weapons, game mechanics – each played a role in giving each episode a unique feel. I’m curious to see if Infinity Ward will bring it back when their turn is up again with Call of Duty and Ghosts 2 comes out in a few years. I think they finally have a good second option to multiplayer, much like Treyarch has the Zombies mode. I’m also curious if Sledgehammer Games is going to have anything similar in Call of Duty: Advanced Warfare, but for that, we have to wait until November to find out for sure. 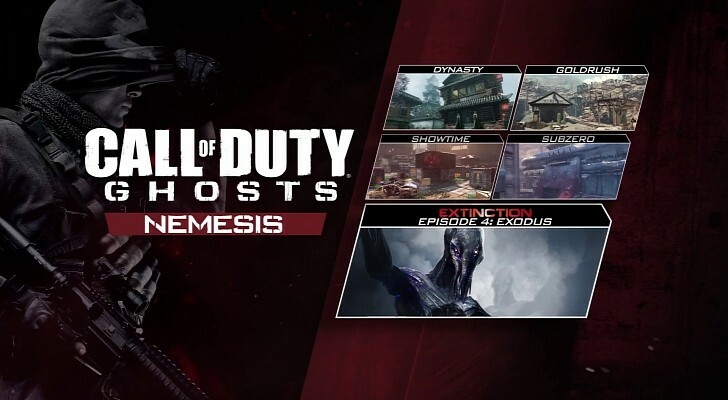 Today is the release of the last DLC pack in the Call of Duty: Ghosts DLC season, the Nemesis map pack. Like the three previous packs, Nemesis comes complete with four new maps for competitive play, along with a new episode of the co-op Extinction story, in this case, the final chapter. As it’s been with the other packs the maps include three brand new maps, and a remake of a fan favorite. So today, let’s look at the four maps, and I’ll talk about Extinction after I have a chance to play through it with my teammates. Set in an old California gold mining town, this map might be the most complex of the new maps. There is a good mix of different sight lines, including a few longer ones; but at the same time, there are a ton of tight corners and tunnels that really let run-and-gun players shine. Beyond the actual layouts of pathways, the map has two different levels, including a large open elevator that moves between each level, but is still open to the upper level. All along the map there is also a couple of minecarts that run along the tracks – these carts can and will kill players if they aren’t paying attention. These carts are also open, allowing players to hop in and ride around the map, probably picking up a couple kills, but the walls aren’t particularly thick, meaning bullets will pierce the carts. The map specific field order reward calls in a bunch of wolves, basically functioning like multiple guard dogs. I think of all the new maps, including previous DLC packs, Sub Zero feels closest to an older, classic Call of Duty map. It really feels like a spiritual successor to the Modern Warfare 2 classic Sub Base. It’s not as symmetrical, with most of the action taking place around a central courtyard, along with a few side alleys and hallways. This might be my favorite of the new maps, there’s a good mix of vertical levels, along with nice mid-range sightlines. The map specific field order, The Beast, calls in a blizzard that blankets the map, along with a group of snow spirits that hunt down enemies in the blizzard. It’s a pretty simple map, nothing too crazy, no real moving parts to worry about – very simple, arena style map. The last of the new maps features a design aesthetic that hasn’t really been featured in Ghosts yet by having Chinese architecture. The map itself is a pretty standard CoD map, a couple different levels, with interconnected pathways that can create some havoc with players possibly being directly above or below others. This is a good close range map, with lots of tight corners, plus shorter sight lines. Beyond that, it’s a good map for stealth loadouts – as usual in Ghosts, the Honey Badger dominates. To me, and probably to most CoD veterans, the map specific field order reward might be the coolest part of the map – it’s the return of the Modern Warfare 2 favorite killstreak, the Harrier Strike. The return of the smallest Call of Duty map in the franchise, Shipment, the re-imagining of it tweaks up the formula on it a little. Showtime is set in a futuristic battle arena, with the same basic layout of shipping containers in the center of the map, including the few open containers around the map. With the updated version of the map though, Infinity Ward has added in an outer section of the map, with halls that surround the interior arena. These halls function as spawns, plus they give players good flanking routes. The map specific reward on this map ties into the future arena style setting. When a certain number of “box kills” are met, a slot machine starts to spin, and the rewards are given to the team that met the quota. These rewards include six care packages dropping in the map, sentry guns popping up around the map shooting at enemies, or a deadly gas attack on the outskirts of the map that force players back into the central part of the map. Even though it’s Shipment, it really doesn’t play too much like the original did – it’s not as fast paced, instead I’ve found teams tend to hold a corner and play very defense oriented. Ultimately, I think Sub Zero is the standout of the map pack.